Windows 10 is here and you need to know how ready you are for this new experience and also what are the minimum specs required for the Windows 10 OS to run on your Desktop PC when upgrading your system. Microsoft recently released the minimum specifications for all devices and versions of Windows 10 and surprisingly, it is technically a “everyone’s invited” spec upon the backdrop of the buzz of Cortana, Continum, android and iOS app porting which many had expected a “super” spec to be required to run them at basic level. Click to See the features of Windows 10. 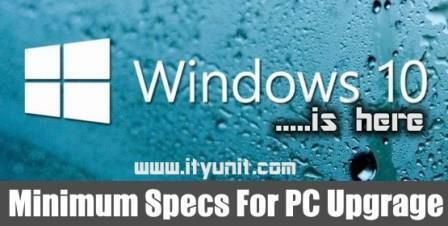 Since the Windows Mobile editions are expected much later, let’s focus on the Desktop Edition specs. According to Microsoft released specs (on Microsoft.com), it would seems that any system that is currently running Windows 8/8.1 comfortably will as well run Windows 10 much more smoothly. This is mainly because the minimum RAM required for Windows Desktop editions is just 1 GB for the 32-bit OS architecture and 2 GB for the 62-bit OS architecture. Full specs below are for the Windows 10 Desktop Editions which Microsoft defines as “An OS that is designed for performing traditional PC tasks that uses the desktop experience. This OS runs native Win32 apps, universal Windows apps, and existing apps from the Windows Store”. This spec released agrees with our previous opinion that Microsoft’s strategy is “creating a Microsoft ecosystem first by encouraging as many people and devices to run Windows then the product-generating-profits will flow in later”. See also: Microsoft announces Windows 10 launch. The Windows 10 Mobile Edition specs presents even more surprises as it is very favorably for midrange devices with a RAM of 512mb and it also supports Intels x86 mobile processors for tablets therefore so expect more affordable phones on Windows 10 as vendors will likely embraced the range of specs supported. So don’t worry much about the specs especially if you are already running Windows 7/8/8.1 smoothly, just get Windows 10 on the PC or laptop and enjoy the party.